After Turin joined our excavations as a partner in 2015, Christian and Lara look back to this first year of their Leiden-Turin excavations directed by the two of them together. So that was it for 2018. After a wonderful season, we closed the site today, 25 April. We find it extremely important to dig slowly and carefully, understand the stratigraphy, and document the whole area – which means literally everything we find – as carefully as possible. For this task, we are very lucky to have found the 3D Survey Group from Politecnico di Milano willing to survey the concession and the ongoing excavations. With their new, ground-breaking method to create 3D models and orthorectified 2D images, we can now document every step of the excavations and ‘undo’ the destruction usually caused by archaeology. The information will soon be uploaded in a new Saqqara information system, which will be an extremely useful tool – not only during the recording phase in the field but also, at a later stage, to re-elaborate the information, share it with pottery, human remains, wood or architecture specialists in a collaborative environment, and disseminate it to the wider public. We thank Prof. Corinna Rossi and her team (Francesco Fassi, Alessandro Mandelli and Luca Perfetti) for their kind cooperation, and also for their great company and friendship in the past six weeks. A new chapel emerges from the sand. We are very pleased with our pottery team: Barbara Aston, who has been working with the expedition since 1986, the year of the discovery of the tomb of Maya and is now finalising an important book on the pottery coming from that tomb; Lyla Pinch Brock, who has been helping Barbara and drawing lots of beautiful pots; Valentina Gasperini, assisted by Alice Salvador, who is studying the pottery coming in great quantity every day from the excavation area to the north of the tomb of Maya. The help of a new team member, Nicola dell’Aquila, photographer of the Turin Museum, has been essential for the documentation of the various artefacts we have found. 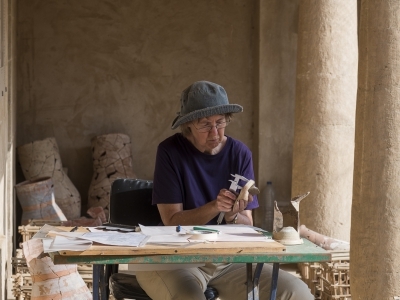 Our pottery specialist Barbara Aston at work. 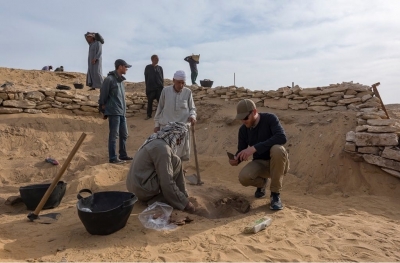 Apart from new methods, we also have new questions that aim at a broader understanding of the site beyond the excavation and documentation of individual tombs. We would like to understand how our concession area functioned over the centuries. As to the pharaonic period: who decided to build his tomb where and why? Which wall decoration schemes were chosen? Which religious activities were performed? But also later, how was the area reused? By whom? And with what purpose? To help answer these questions, our excavations are currently also funded by the Dutch Organisation for Scientific Research (NWO) as part of a research project called ‘The Walking Dead at Saqqara: The Making of a Cultural Geography’, supervised by Lara Weiss. 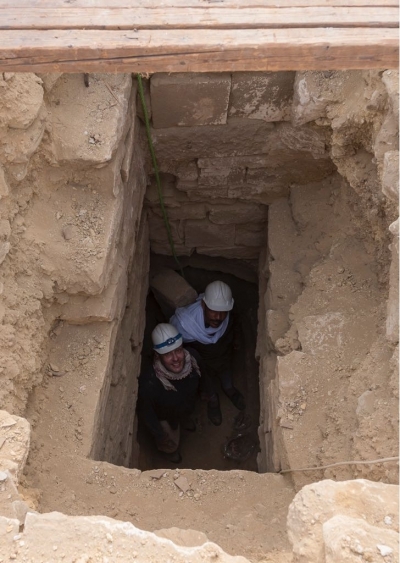 For this project, the area the Leiden-Turin team is currently excavating is particularly interesting, because it is an area in-between larger tombs where we can detect the activities of the ancient Egyptians over several millennia. In the New Kingdom, roughly around 1200 BCE, three very nice small limestone burial chapels were built in front of related burial shafts leading to subterranean burial chambers. The burials of the Late Period, in the 5th and 6th centuries BCE, were often accompanied by so-called embalmers’ caches, in which the used mummification materials of the burials of that time were placed (and sometimes burnt). Yet again 6 or more centuries later, the Late Antique population lived here near the Monastery of Apa Jeremias, sometimes burying their children under the floor. Deputy director Paolo Del Vesco and archaeologists Miriam Müller, Nico Staring, Sarah Schrader and Jelene Ali Scheers have uncovered and documented every layer, and retrieved digging activities in the 19th century. It shows that the treasure hunts at that time were timely organized and systematic. We found three pits at equal distances from each other, of which the third one still had a 19th century basket inside. At the end of the season it is time not only to thank our awesome team from Leiden-Turin, but also our Egyptian workmen for their hard work and enthusiasm, our Egyptian colleagues for their assistance and support, and last but not least our cooks Atef and Islam for taking good care of us in the dig house. This was an amazing season, and we are greatly looking forward to 2019! 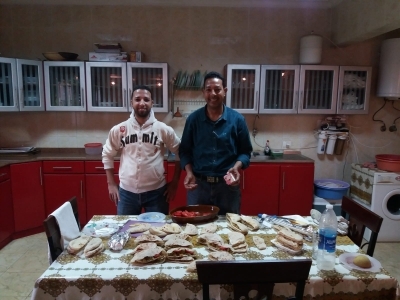 Our cooks Atef and Islam. Overview over the site at the end of the season. 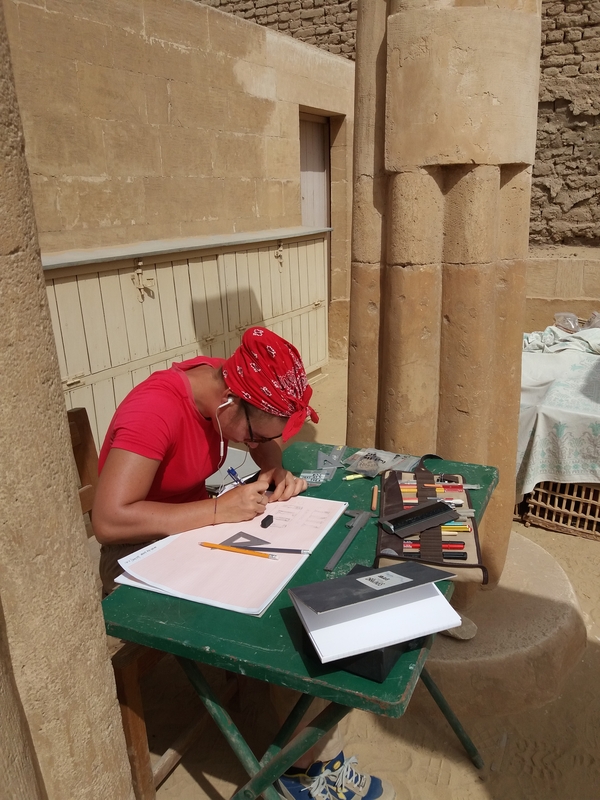 Artist Alice Salvador drawing objects in the tomb of Horemheb. 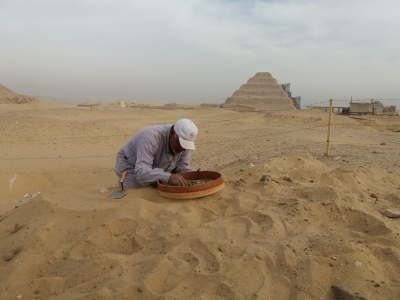 Our Egyptian colleagues restoring the larger Ramesside chapel north of the tomb of Maya. Since arriving in Saqqara two weeks ago, I’ve been working on the bone material: new finds as well as bones found in previous seasons. When I arrived the new storage space in the tomb of Maya had just been finished. 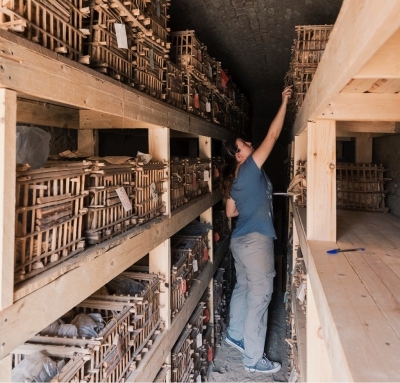 The bones found during the excavations of the tombs of both Maya and ‘Pay & Raia’ had been stored here in wooden crates since they were last studied. These crates were labeled by the previous excavators, but the storage situation was not ideal. Stacked five high on top of each other, the wooden crates had started to deteriorate considerably since the late ’80s and ’90s. A carpenter has now built wooden shelves, which greatly improves the accessibility of the crates (especially if you need a crate from the very bottom!) and creates a safer work environment (no more collapsing crates). When I arrived, all crates were put out into the forecourt of the tomb of Maya to make space for the construction works inside the storage room. I spent the first few days in the field figuring out what was in the crates, making an inventory, and then placing the bone material orderly into the ‘new’ storage room. From next year onwards, the bone material will be placed in plastic boxes as a next step of improvement, in terms of both storage and accessibility of the material for future research. Ali sorting the crates in the new storage shelves. After the storage room was completed, I focused on the loose bone material that was found this year. ‘Loose bone material’ includes all bones found during the excavations without any relation to other bones, i.e. bones that were not found in situwith a skeleton. When robbers entered a tomb to look for valuables, the skeletal material itself was not important to them. This material then often ended up scattered around the tomb shafts. As time moves on, the elements and animals in the area caused the bones to scatter farther and farther from the shaft they originally belonged to, until we excavate them. Of course, we don’t know where the bones have moved over time, so when excavating loose bones it is usually impossible to reassemble them to reconstruct skeletons. Therefore this material is quite challenging to interpret. What I do, is to record in detail what bone has been found where, and then use this information to make an educated guess about what we have found. Excavating one of the child burials. As there are many small bone parts which could get lost, the sand around the burial was carefully sieved. For example, if we found two left legs, two right legs, one right arm and three skulls in a certain context, I can say that at least three individuals are represented here: the left and right legs might belong to two individuals, but they might also belong to four separate individuals. The skulls provide me the clearest indication: at least three individuals were represented, as an individual with three heads is slightly unlikely. As we’re digging deeper in the north area, the amount of scattered bones and bone fragments appearing from the sand becomes smaller. Last year, when we were much higher up, I processed around 1600 loose bones. This year, I’ve only processed around 300, leaving me much more time to focus on other things – such as the nice burials we found. Three of the four burials we found belonged to subadult individuals: a cursory examination of the remains indicates that one belongs to a neonate and one to a child between two and three years of age. These two burials were each wrapped in a cloth, which I have painstakingly removed from the remains of the little skeletons. The removal is hindered by the fact that some of the cloth falls apart as soon as you touch it, and the other part is clumped together in an impenetrable mass. So I’ve been slowly wetting part of the textile, in order to carefully lift it with my tweezers. Add in the fact that the bones themselves are lying quite loose in the material, that is a situation where you barely dare to breathe when working in hot weather conditions. Once a burial is fully excavated, it is ready for further analysis. Since we have only three working days left, this will probably be a job for next year. Hopefully I’ll be able to update you on my findings then! Excavating the sole adult burial of this season. In order not to disturb the contexts around the burial, we sometimes have to take on uncomfortable positions! The second week of excavation has been completed. We still have three weeks of work ahead, but already interesting results were reached. We extended the excavation area of about 100 square metres to the west of the two small Ramesside chapels found last year. The extension of the area also allowed us to remove another section of the old retaining wall that was built to prevent the sand from flowing back in the late 1980s after the excavation of the tomb of Maya. This revealed more of the thick mudbrick wall found last year immediately to the north of Maya’s external wall, and most likely pertaining to another New Kingdom tomb. We must also mention the careful stratigraphic investigation of the interesting Late Antique occupation levels, plastered installations and walls carried out by our Leiden University team member Miriam Müller (fig. 1), and the excavation and recording of new Late Period embalming deposits by Nico Staring. All archaeological documentation this year hugely benefits from the participation in the Dutch-Italian archaeological fieldwork of the 3D Survey Group (fig. 2). The group is an Italian interdisciplinary team of engineers, architects and archaeologists based in Milan, working and carrying out research on cultural heritage. 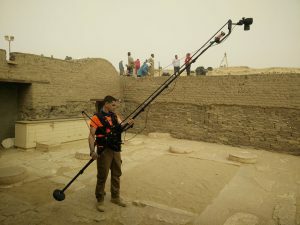 In particular, the team is specialized in 3D survey techniques and modelling applied to cultural heritage and environment. Read more about their work in their own Digging Diary! Since 2010 the Milan team has been developing an informative system for the management of the Veneranda Fabbrica del Duomo di Milano, the main cathedral of Milan, based on the 3D survey of the whole monumental building. At the same time, members of the team have been involved in the 3D survey of the archaeological excavation of the underground station ‘Municipio’ in Naples, where photogrammetric survey techniques were thoroughly tested. 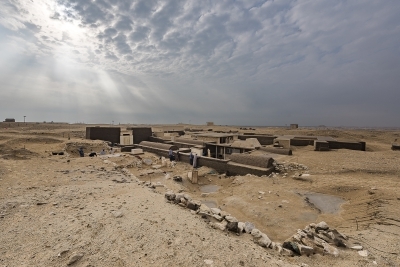 The 3D Survey Group is also the main research group of the ERC-funded project LIFE (Living In a Fringe Environment), directed by Dr Corinna Rossi, focussing on the interdisciplinary study of the Late Roman settlement of Umm al-Dabadib, located in the Kharga Oasis (Egypt’s Western Desert). The team is now developing a new line of research and investigation focussing on creating an informative system specifically dedicated to archaeological excavations. 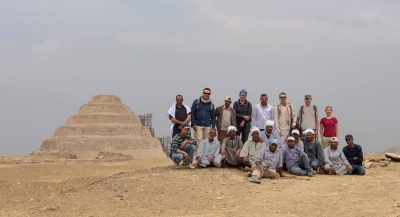 The Group’s main task at Saqqara is to survey the concession and the excavation. This may sound like a simple task, but it is done in an innovative and ground-breaking way – providing 3D metric and accurate representations nearly real-time during the excavation, and 2D orthorectified images immediately after the daily fieldwork. All this information is then uploaded into the new Saqqara information system; an extremely useful tool not only during the recording phase in the field but also, at a later stage, to re-elaborate the information, share it with specialists working on the pottery, human remains, wood or architecture in a collaborative environment, and disseminate it to the wider public. During the first week of work, the existing fixed points to which the topographic survey is tied were double-checked using the expedition’s new total station. Then two separate activities started: the overall 3D survey of the already excavated tombs, and the detailed 3D survey of the area that is being excavated, using photogrammetry for all the different contexts identified. 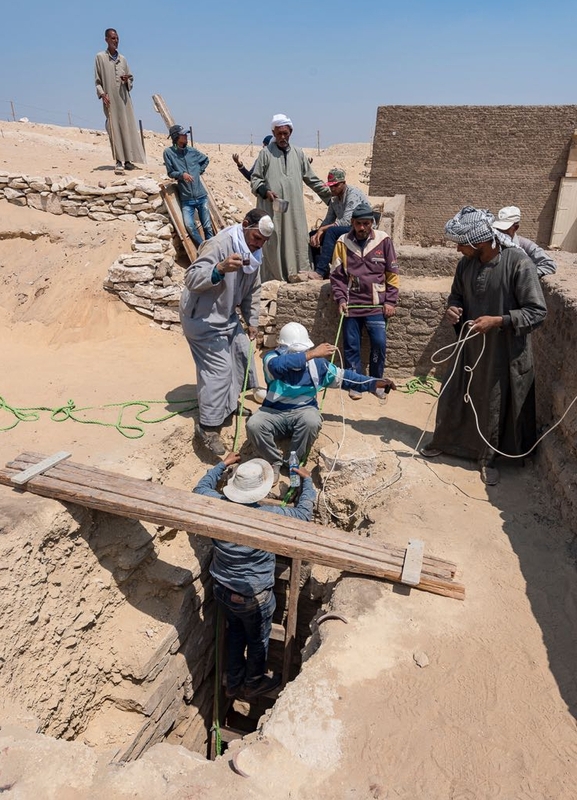 The aim of the general survey of the already excavated tombs is also to fix the absolute and relative position of each monument, previously surveyed independently from one another. 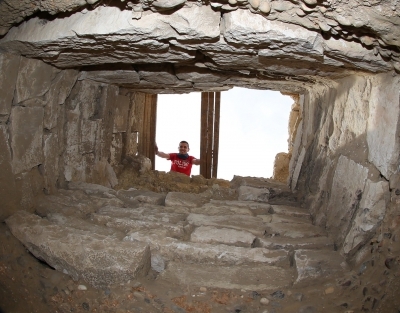 By the end of this third week, the Milan team completed the survey of the tombs of Maya (fig. 3), Tia and Tia, Horemheb, Pay and Ray, Meryneith (fig. 4) and Ptahemwia. The photogrammetry has been preliminarily elaborated by our laptops during these afternoons of work back in the dighouse and added to the general survey of the expedition’s excavation area. The photogrammetric survey of the excavated contexts is being carried out with a resolution of 0.5 mm, in order to fully grasp the composition of the various deposits and structures that are being exposed and removed during the fieldwork. Recording the contexts with a 3D georeferenced web-based informative system is a complex and innovative challenge and Francesco, Alessandro and Paolo have been spending long evenings discussing the best and most efficient way to structure the information that is being collected, with the support of the other members of the 3D Survey Group working from Milan. This part of our work is giving us the chance to carry out not only an interesting fieldwork, but also a challenging piece of research on the field together with our colleagues of the Museo Egizio. In this respect, the 3D Survey Group wishes to thank the co-directors of the mission, Dr Christian Greco and Dr Lara Weiss, for the invitation to join their fieldwork, and looks forward to continuing this interesting and fruitful collaboration. 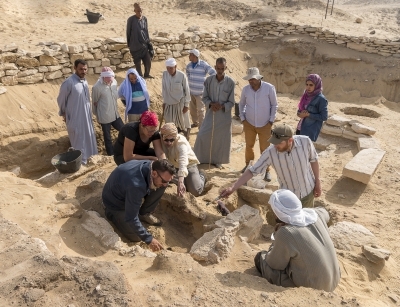 It’s our third week in Egypt, the second in which we are actually excavating. Miriam is carefully clearing the hill north to our two small Ramesside chapels, in an area that we call the Coptic occupation layer (Fig. 1), i.e. not actually a house, but the remains of some occupation. Particularly interesting was the find of the dump of some workshop materials among which two flint stone knifes, a whetstone and a polishing stone. Underneath the first limestone walls showed. This means we are on our way to Ramesside age. In the meantime, the Milano 3D Survey group has finalized the scan of the tomb of Maya (Fig. 3) and is now continuing with the tomb of Tia and Tia. The results are amazing. Read more about their work next week! Two scholars from Leiden University joined the team! 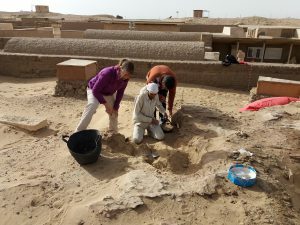 Miriam and Sarah have successfully started working at Saqqara. They are specialists on human bones and Egyptian archaeology and material culture. Sarah and Miriam were very happy to accept the invitation by the Leiden-Turin mission to look for a potential cooperation between the museums and the university with the possibility to bring bachelor and master students to Egypt to study the archaeology and material culture of ancient Egypt at such an exciting place! 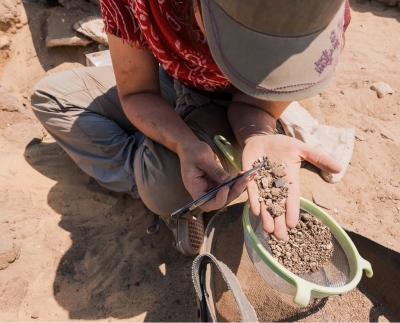 In her role as new assistant professor at the Faculty of Archaeology at Leiden University, Sarah specializes in the analysis of ancient human bones. 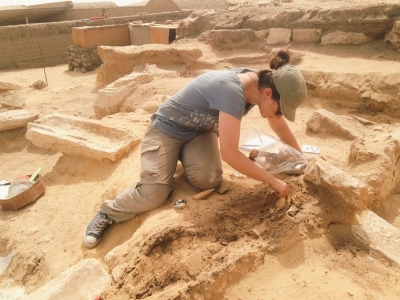 For the Saqqara excavations she has now started analyzing the bones that were excavated last season (Fig. 2). So far, she has studied several child burials. There are no obvious diseases present on the bones of these children, which may suggest that they died suddenly. Sarah also found evidence for mummification – a plug in the ear of a skull, which appears to be very intentionally placed. Linen was often placed in the ears of the deceased so that evil spirits would not enter the body. Sarah has a lovely workspace in the tomb of Horemheb, where the skeletal material is conveniently stored. Miriam Müller is carefully clearing the hill north to our two small Ramesside chapels. 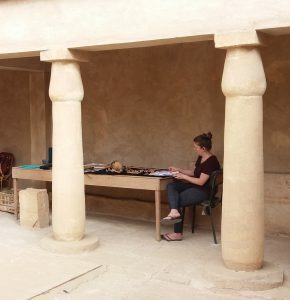 Sarah Schrader in her workspace in the tomb of Horemheb: analyzing human bones excavated last season. 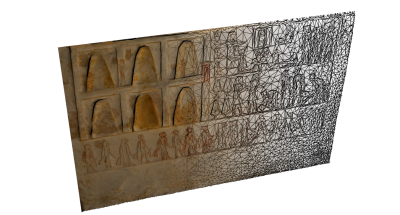 The Milano 3D Survey group has finalized the scan of the tomb of Maya.